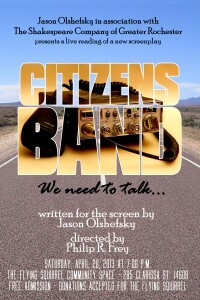 We will get a group of actors to read the roles and do a script-in-hand reading with Phil directing. While he will bring his own expertise, my pattern is the script-in-hand readings at Geva Theatre for new plays wherein the group of actors sits at the rear of the stage and, for the scene being read, only the actors reading step forward and speak. The audience is invited to stay for a discussion afterward and to be ready to offer comments such as whether they found the characters generally appealing, if their dialog is natural and accessible, if the relationship story arc is interesting and engaging, if the overall story is engaging, and if there are any weak or strong areas to focus on. After the reading, the responses from the audience will guide the editing process. We will also be watching the audience to identify attentiveness, overall mood, laughter, etc. 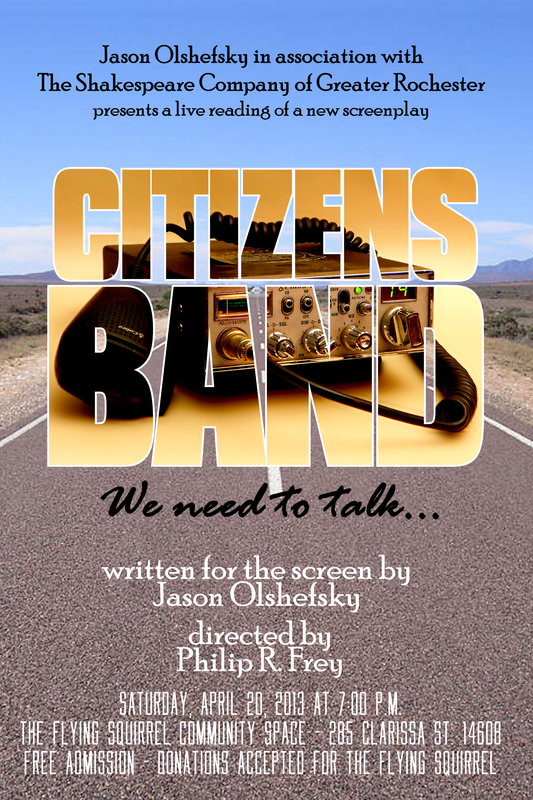 The performance will be held on Saturday, April 20, 2013 at 7 p.m. at the Flying Squirrel Community Space. The reading will take approximately 2 hours and 15 minutes, and the discussion afterward should last 30 to 45 minutes. The reading is free and donations will be accepted for the Flying Squirrel. We set up a Facebook event as well. Join it if you'd like.